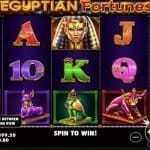 Victorious slot is a 5 reels and 243 paylines video slot game powered by NetEnt software platform. The game is based and inspired by Gladiators (Roman times). The wild card of the game is a Golden Eagle, while Scatter is Golden wreath. 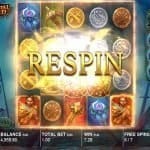 You can play the game for 25p to £125 a spin. You can play Victorious slots at these NetEnt Online Casinos. The game provides a jackpot of 1500 times of your total bet and return of the player percentage for this slot game is 96.9, which is awesome. Five Basic terms involved in this game are “Level”, “Con Value”, “Spin”, “Max Bet” and “Auto Play”. Min coins per line are 1 and max coins per line are 10. Just like this min coins Size is 0.01 and max coins size is 0.05. 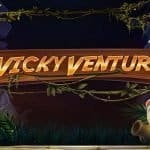 If a player hits 3 or more scatters at one time, he would trigger 15 free spins, 4 Golden Wreaths will activate 20 Free Spins and 5 scatters will activate 25 Free Spins for the player. 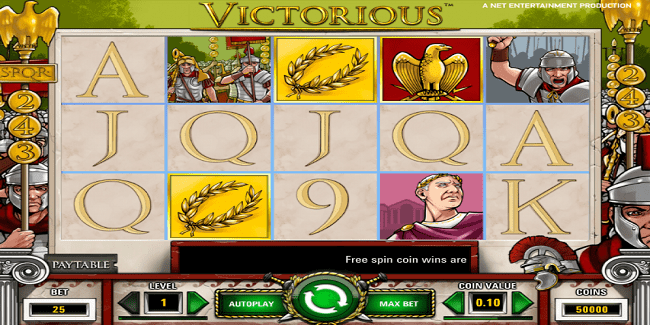 A jackpot of 1500 times of your total bet will be won when 5 symbols of Julius Caesar appear on an active payline.